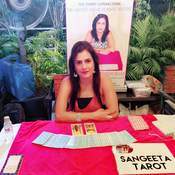 Sangeeta Jhangiani is a gifted psychic; she has been reading the Tarot since many years. 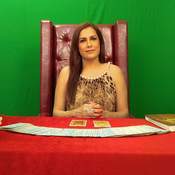 Today she is known for an excellent grip over the art of Tarot Cards Reading, Consulting and Teaching. 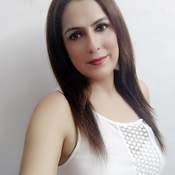 Since her childhood, Sangeeta has been able to guide & motivate her family, relatives and friends, and progressively others as well, with her God-gifted special intuitive power and the guidance of the Tarot. 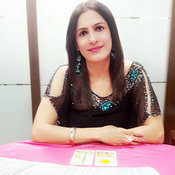 Apart from Tarot Master Consultant & Tarot Master Teacher Sangeeta is also a Graphologist (Handwriting) & Signature Analyst through which she analyses personality and thought process of the person. 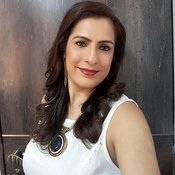 Sangeeta’s psychic tarot readings, Handwriting & Signature Analysis help in all matters: Career, Business, Finance, Marriage, Friends, Love, Family, Education, Health, Travel, Life Span etc. She does an in-depth analysis of your situation and delivers an empowering and positive outcome, thus guiding you through obstacles in the past which may be holding you back at the present. She then continues through to the future outcome of your situation. Sangeeta will not make decisions on your part but encourages you to make choices for yourself without her being judgemental about you. Her aim is to provide you with as much of information as you need to walk away, feeling clearer, stronger and lighter, and even more in tune with your path and purpose. Her Tarot predictions aim to provide you a clear vision and act as an inspirational source for a bright future. Her telephone readings are just as incredible as her face to face sittings and tend to be just as accurate. As she keeps moving around different cities, she is often consulted on the telephone. 1)DERRICK ANGELSZ World Alternative Therapy Recognition & Fellowship Awards-1 in the field of TAROT-May-2014. 3) DIAMOND OF INDIA Award for Outstanding Individual Achievements and Distinguished Services to the Nation -May - 2015. 6) FRIENDS OF INTERNATIONAL SINDHI'S AWARD as Tarot Master Consultant & Teacher, Handwriting & Signature Analyst - Oct-2016. 1) Distinguished Guest for 26th Annual Prize Distribution of Sindhi Classes Conducted by the Trust-2016. 2) Guest of Honour at Sita Sindhu Bhawan, Temple of Honouring Sindhi Artists from all over the World -2016. 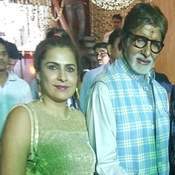 3) Special Bollywood Astrologer Guest by Renowned Film Producer Shri T Manwani Anand for Diwali Milan Samaroh for Senior Citizen Brotherhood of Lokhanwala - 2016. 4) Celebrity Guest at Navi Mumbai's Talent Hunt - 2016. 5) Special Guest for Mahila Mandal, Lokhanwala Andheri W - 2016. 6) Distinguished Guest for Shri Guru Nanak Matrimonial Services - 2016. 7) Guest of Honour for Press Conference for Maharashtra Para Sports by Happy Foundation - 2017. 8) Guest of Honour for Maharashtra Para Sports "Finale" by Happy Foundation - 2018. 9) Guest of Honour in Bharat Icon Award 2018. 10) Special Guest for CED's 21st Century Happiness Curriculum For National Educators - 2019. Tarot Predictions for 12 Zodiac Signs for "Glam & Glaze Fashion Magazine". Tarot Predictions for "Fashion Ok Please"
Weekly Tarot Predictions for "Hindvasi" Newspaper. 1) Tarot Show on "Astrovani" Channel on Airtel. 1) Hosted Tarot Show Daily on Swoo. 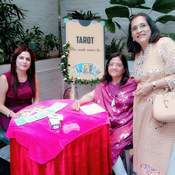 2)Hosted Tarot Show Daily Morning 10.30 am to 11.30 am on Bigo. 3) Hosted Tarot Show Daily Morning 10.30 am to 11.30 am on Mi Live. 4) Astrology Live Show everyday morning between 8.30am to 9.15am on #fame. 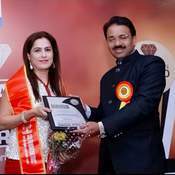 Sangeeta has been associated with various companies for Corporate Events such as Citius IT Tech, Ultra Tech Cement, Blue Star Infotech, Pico Express - Nilgai Foods Pvt Ltd; Skoda Automobiles, Mercedes Benz, Seagate, Aditya Birla Cement - Eureka Forbes, Fashion Inferno and more. 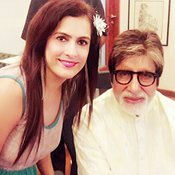 She has also done special events in Five Star Hotels, Private parties, Banquet halls and more. 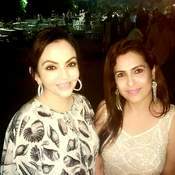 She was also invited as a Tarot Reader for Sangeet Function of Film Producer Mr.Vashu Bhagnani's daughter Honey Bhagnani and also at the Post Wedding Function of Isha Ambani at Reliance House, Alibaugh - 2019. 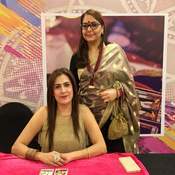 She was also invited as Tarot Card Reader for the UMANG Festival -2015 at N.M. College, Mumbai and by Farmaish Club at Vadodara (Baroda) for her Tarot Services - 2018. 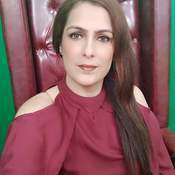 Sangeeta's list of clients includes film personalities, industrialists, professionals, businessmen, home makers and students - Nationally and Internationally.
" Spirituality has many paths. I use tarot to help me be intuitive." I also do Graphology (Handwriting) & Signature Analysis which is a Science "To analyse human behaviour and thought process of the person".
" Tarot is a way for me to gain insight on many things. I like to help people, and Tarot Reading allows me to do just that "
"Graphology (Handwriting)" is an "Art of determining character of the person".It is Current state of mind. "Signature" is person's actual personality. It is the minimum set of letters which gives maximum information about a person.